Adopted on May 9, 1902. 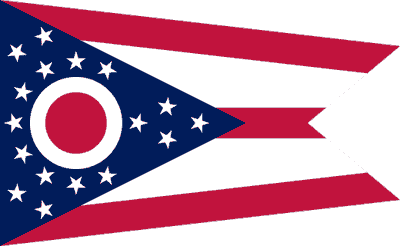 Ohio's official flag was adopted by an Act of the Ohio Legislature on May 9, 1902. The Ohio burgee, as the swallow-tailed design is properly called, was drawn by John Eisenmann, architect and designer for the Ohio State Pan-American Exposition Commission. Flag is a guidon consisting of 5 horizontal stripes alternating between red and white. The chevron is azure containing a white and red "O" and 17 white stars. Drawn by John Eisemann, architect and designer for the Ohio State Pan-American Exposition Commission, it is the only American state flag that is non-rectangular, and one of only two non-rectangular official jurisdictional flags, at the state level or above, in the world (the other is the flag of Nepal). Loosely based upon the design of cavalry flags of the Civil War and Spanish-American War, this type of flag is known as a burgee. The flag forms the basis of the logo of the NHL hockey team, the Columbus Blue Jackets. It is also regularly flown by The Ohio State University Marching Band during football games. Specifically, the flag of Ohio is flown by the percussion section of the band (JI-Row) which has embraced the flag as its row mascot. Mr. Eisenmann explained its symbolism most aptly: "The triangles formed by the main lines of the flag represent the hills and valleys as typified in the State Seal, and the stripes the roads and waterways. The stars, indicating the 13 original states of the Union, are grouped about the circle which represents the Northwest Territory; and that Ohio was the seventeenth state admitted into the Union is shown by adding four more stars. The white circle with its red center, not only represents the initial letter of Ohio, but is suggestive of its being the 'Buckeye State'." When the flag of Ohio, or any state, is flown on the same halyard with the flag of the United States of America, the latter should always be at the peak. When flown from adjacent staffs, the Stars and Stripes should be hoisted first and lowered last. 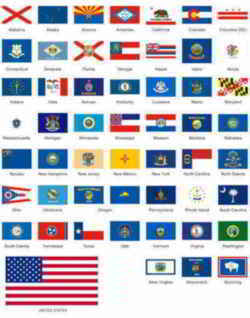 When a number of state flags are grouped and displayed from staffs with our national flag, the latter should be at the center or at the highest point of the group. When carried in a procession with the Ohio flag, or any state flag, the flag of the United States should be on the marching right. When there is a line of several state flags, the national flag should be in the front and center of that line. Pledge to the state flag. "I salute the flag of the state of Ohio and pledge to the buckeye state respect and loyalty" is hereby adopted as the official pledge to the state flag. 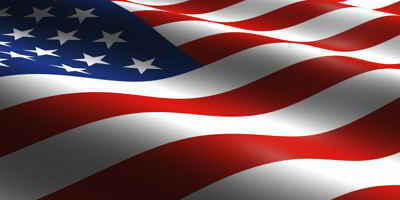 The pledge shall not replace, preempt, or be recited before the pledge of allegiance to the United States flag. Ohio Revised Code, General Provisions, Chapter 5. The flag of the state shall be burgee-shaped. It shall have three red and two white horizontal stripes that represent the roads and waterways of the state. The union of the flag shall be seventeen five-pointed stars, white in a blue triangular field that represents the state's hills and valleys, the base of which shall be the staff end or vertical edge of the flag, and the apex of which shall be the center of the middle red stripe. The stars shall be grouped around a red disc superimposed upon a white circular "O. "The thirteen stars grouped around the "O"represent the original states of the United States and the four stars added to the peak of the triangle symbolize that Ohio was the seventeenth state admitted to the union. The "O"represents the "O"in "Ohio"and suggests the state's nickname, the buckeye state. The proportional dimensions of the flag and of its various parts shall be according to the official design on file in the office of the secretary of state. One state flag of uniform dimensions shall be furnished to each company of the organized militia. The flag of the governor of this state will be of scarlet wool bunting, six feet eight inches hoist by ten feet six inches fly. In each of the four corners will be a white five-pointed star with one point upward. The centers of these stars will be twelve inches from the long edges and seventeen inches from the short edges of the flag. In the center of the flag will be a reproduction of the great seal of Ohio in proper colors, three feet in diameter, surrounded by thirteen white stars equally spaced with their centers on an imaginary circle four feet three inches in diameter. All stars shall be of such size that their points would lie on the circumference of an imaginary circle ten inches in diameter. The official colors of the governor of Ohio will be of scarlet silk, four feet four inches on the pike by five feet six inches fly, of the same design as the flag of the governor of Ohio, with the seal and stars proportionately reduced in size and embroidered. The colors will be trimmed on three edges with a knotted fringe of yellow silk two and one half inches wide. Attached below the head of the pike will be a silk cord of scarlet and white eight feet six inches in length with a tassel at each end. 5.012 Display and maintenance of state flag. (A) Display of the state flag at all state buildings and public institutions, such as public school buildings and state parks, is encouraged. If the state flag is displayed, it may be flown every day when weather permits and shall be flown from sunrise until sunset on all national and state holidays and on any other days that the governor proclaims. The state flag may be flown at night when properly lighted. When the state flag is displayed outdoors, it shall be flown either from a flagpole or a staff. Any staff from which the state flag is flown shall be at least two and one-half times as long as the state flag. (B) When the state flag and the United States flag are displayed at the same time, the state flag shall not be larger than the United States flag. When the state flag and the United States flag are displayed together against a wall from crossed staffs, the state flag shall be on the left of the United States flag, and the staff supporting the state flag shall be behind the staff supporting the United States flag. When the state flag is flown from the same halyard as the United States flag, the state flag shall be displayed beneath the United States flag. When the state flag is carried in a procession in which the United States flag is unfurled, the state flag shall be displayed on the marching left of the United States flag. 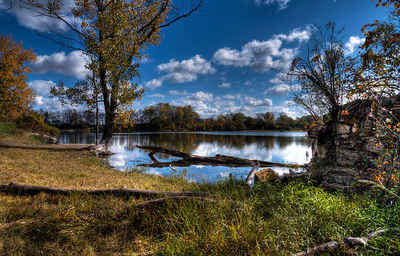 (C) The state flag shall be washed or dry cleaned when soiled and may be repaired. When the state flag is damaged beyond repair, it shall be destroyed privately either by cutting it into small pieces and burning it until only ashes remain or by sealing it in a plastic bag or box before discarding it in a trash collection. 5.013 Pledge to the state flag. 5.014 Procedure for folding state flag.